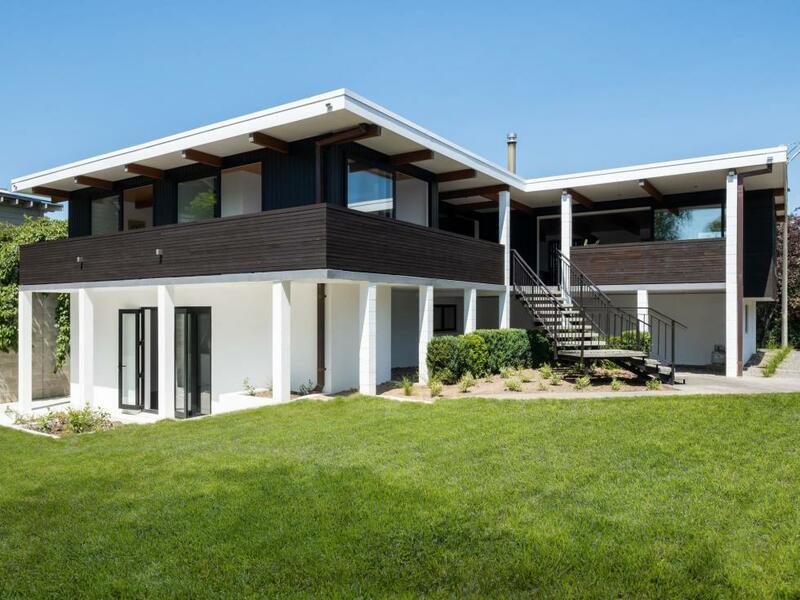 For those who appreciate high-end contemporary design this extensively renovated home by Crosson Clarke Carnachan Architects will undoubtedly be a thrilling find. Set in a highly desirable Havelock North location, this extensively renovated 390 sqm home, situated on a corner section of just over 800 sq m, offers an exceptional high-end residence to the market. Quality finishes and thoughtful design are evident everywhere in this property from the polished concrete floor, to the raw steel circular stairwell and floating hoop pine ceilings. Bespoke joinery is a feature throughout and custom sliding shutters on the windows are just one example of how design has been cleverly executed to achieve practical comfort. The kitchen is a triumph with finishes ranging from a custom concrete benchtop, to sleek stainless steel which offsets the rawness of the concrete beautifully. Solid wood kitchen cabinetry, created from oak wine barrel staves, adds the perfect amount of texture and soul to this combination of materials. A butlers pantry provides generous storage and offers the practicality of being able to work and utilise this storage out of view of the main kitchen space. Push back the stacking sliders from this open plan kitchen/living/dining space and enjoy the seamless indoor/outdoor flow onto the upper patio. The features keep rolling in this four bedroom, two bathroom property. The master has a walk in robe as well as a second wardrobe, and this bedroom opens up onto a patio enjoying lush treetop views. The two bathrooms are luxurious with generous rain-head showers and are designed to seamlessly fit with the homes aesthetic. There is a large multi-purpose second living/rumpus or media room downstairs as well as a large wine cellar, separate laundry and triple car garaging. Land to both sides of the property offers up scope for significant landscaping options. Our owners have invested to meet the 2019 market, rather than test it, a sale on or before Auction day is our sole agenda.